Mahnmal gegen Krieg und Faschismus, a memorial to the civil victims of the Second World War, was unveiled on November 24, 1988. “Tor der Gewalt,” which is generally translated as “Gates of Violence” or “Gates of Power” or sometimes “Gates of War” is the first part of this memorial. Images of war was carved from a piece of granite taken from the quarry next to the Mauthausen concentration camp. The stone is rent in two. 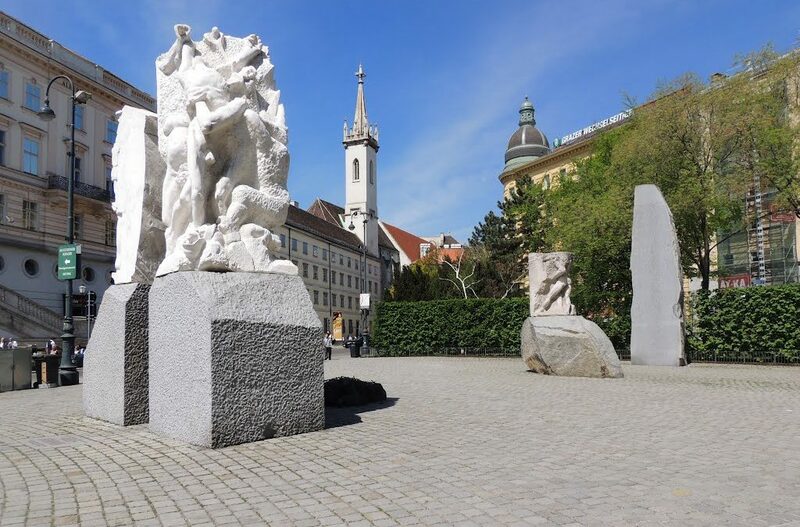 The one on the left honors victims of repressive actions and persecutions under Nazi regime between 1938 and 1945, along with victims of prisons and concentration camps. The right part of the “Gates of Violence” honors all casualties of the Second World War, both civil and military. The most well-known figure is of woman upside down, giving birth to a child, symbolizing the generation who has not seen the horrors of war. Through the “Gates of Violence” is a crouching bronze statue, depicting an old Jew, suffering humiliations. The back of a statue covered with a barbed wire – one of the symbols of imprisonment within concentration camps. Next, is “Orpheus enters the Underground world,” a stone man that honors people who resisted Nazi regime and civil casualties of air strikes. “The stone of Republic” stands next to the Orpheus and symbolizes the will of freedom and independence.